In late 20th-century Europe, both national and regional loyalties have retained a surprising strength and topicality, despite the advance of supra-national integration. This volume addresses some specific aspects of this phenomenon that lay at the centre of the interdisciplinary work of the first European Forum of the European University Institute in Florence during the academic year 1993/94. 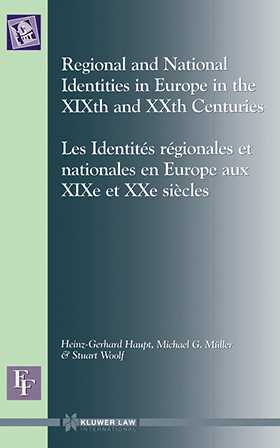 It aims at contributing to a better understanding of the origins and the nature of territorially-based identities in Europe, and it also offers some analysis of current problems arising at various levels of the relationships between regional, national and international structures. The contributions to this volume refer to three major fields of historical and contemporary research: The study of the factors that constitute territorially-based imagined communities. Under what conditions can certain cultural characteristics shared by a given group (such as language, religious affiliation or cultural heritage) acquire social and political meaning in a process of creating territorial loyalties? And how do regional and national loyalties relate to other patterns of particularist group identities? In examining these questions, special attention is given to the concept of primordial identities and to the problem of ethnicity. The analysis of the mechanisms by which particular group interests (social, political, or cultural) are translated into narratives of regional or national identity. The loyalty to a community within a given territory is never merely a product of `invention' and of arbitrary ideological indoctrination.